We sell only the best-in-class products on the market. All products are designed to improve oil life, improve product quality and provide a sustainable solution that reduce oil waste. Our NSF-certified Masterfil® Filters remove particulate as small as ½ micron, increasing oil life an additional 40% to 150%. We have engineered the best filter machines in the industry -period! Designed in three capacities - 60lb, 90lb &120lb. Exceptional quality at an exceptional price. Our unique boil out is not only the best product in the market, but also is delivered in premeasured dissolvable packages. Measure your oil quality with Testo dielectric testing unit, oil color kits or litmus test strips. We have the industry-leading filter aid powder available. Contact us for oil management services. Our filters fit any fryer manufacturers standard equipment. 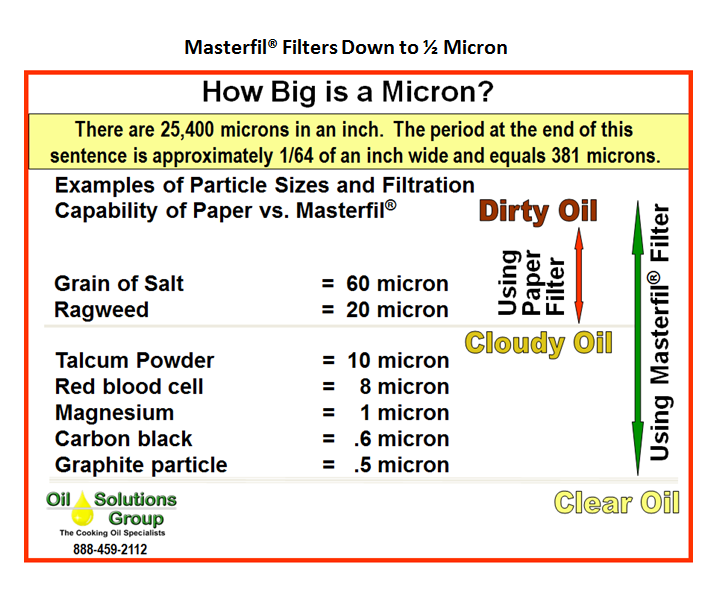 The Masterfil™ filter is a revolutionary breakthrough in oil filtration. Made of a synthetic material, it is NSF and FDA Certified, and filters out particles as small as ½ Micron. That is a particle size as small as cigarette smoke. A magnified cross section of the filter below demonstrates how the weave of the filter creates a tortured path for oil to travel from one side to the other. Along the way, particulate is trapped in the small voids and crevasses. 4. Change any of the values in yellow cells to your specific values. Reduce Oil Cost by 40% or more with Masterfil.